Click on image to enlarge for easier reading and printing. The purpose of the NSGCD Clutter–Hoarding Scale* is to guide professional organizers and related professionals in their initial, pre-session (phone or onsite) contact or first session assessment work. This scale is primarily based on the interior of a home, except where the outside structure affects the overall safety of the interior, as indicated. It does not include sheds and unattached garages or outbuildings. The NSGCD Clutter-Hoarding Scale is an assessment measurement tool developed by the National Study Group on Chronic Disorganization (NSGCD) to give professional organizers and related professionals definitive parameters. These parameters relate to health and safety issues and present a potential range in which professionals may choose to work. One problem found in any of these four categories may indicate the need for further investigation regarding the whole level. Level I. Household is considered standard. No special knowledge in working with the chronically disorganized is necessary. Level III. Household may require services in addition to those of a professional organizer and related professional. Professional organizers and related professionals should have significant training in chronic disorganization and have developed a network of resources, especially mental health providers. Level IV. Household needs the help of a professional organizer and a coordinated team of service providers. Psychological/medical issues or financial hardships are generally involved. Resources will be necessary to bring a household to a functional level. These services may include pest control, crime-scene cleaners, financial counselors, and licensed contractors and handypersons. Level V. Household will require intervention from a wide range of agencies. Professional organizers should not venture directly into working solo with this type of household. The Level V household may be under the care of a conservator or be an inherited estate of a mentally ill individual. Assistance is needed from many sources. A team needs to be assembled, which may include social services and psychological/mental health representatives, conservators or trustees, building and zoning, fire and safety, landlord, legal aid and/or legal representatives. A written strategy needs to be outlined and contractual agreements made before proceeding. *This scale was publicly released in October 2003. 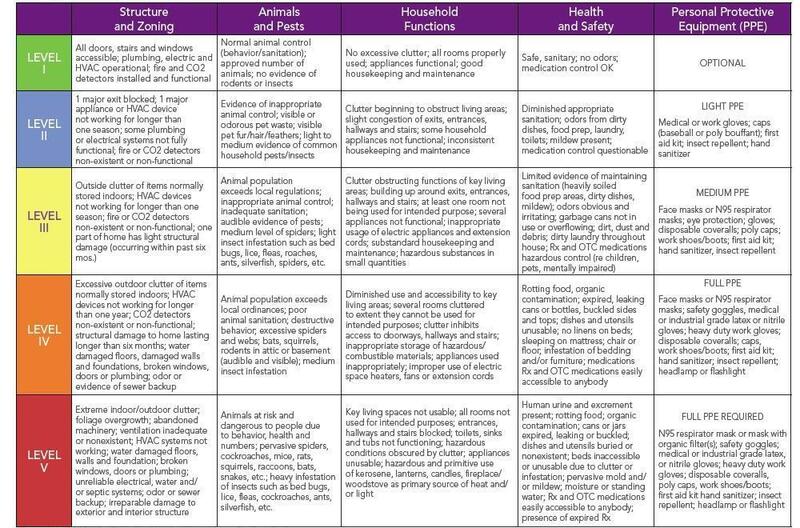 Individuals or agencies quoting Levels as listed on this chart should list the NSGCD as the creating organization. 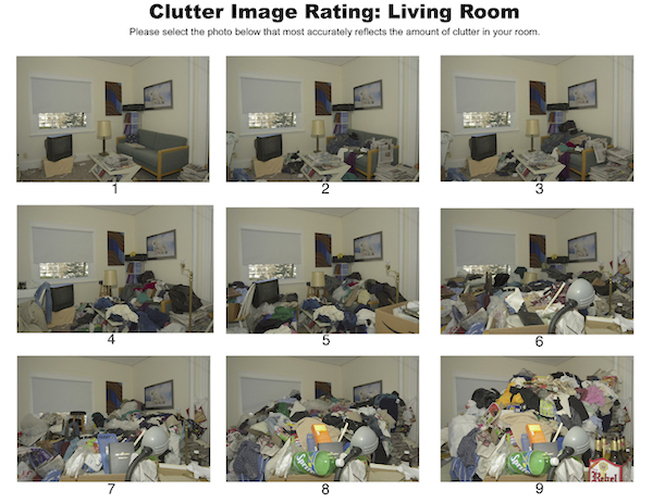 Developers of this Clutter-Hoarding scale are NSGCD members Sheila Delson, Cindy Glovinsky, Terry Prince, and Heidi Schultz. We offer compassionate, personalized & professional hoarding clutter cleanup management services. Schedule your FREE home estimate.